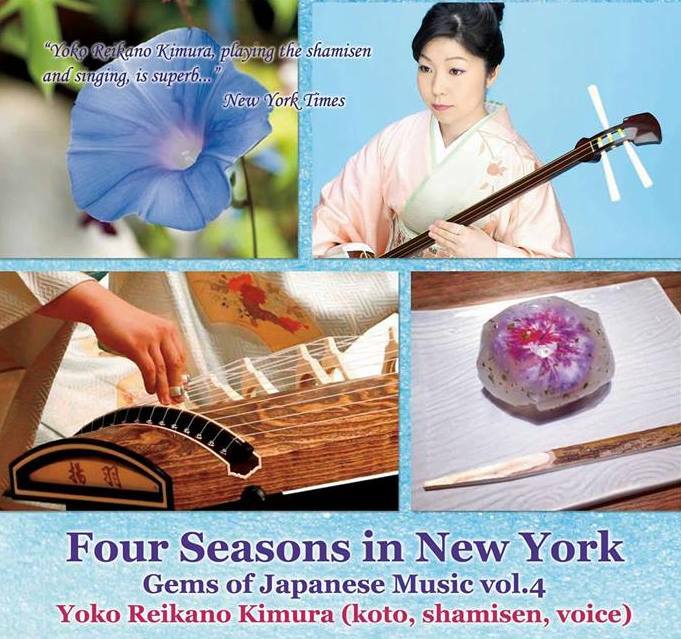 Sunday, July 17 at 4:00 p.m. until 5:30 p.m.
CRS & Mar Creation, Inc. invite you to discover traditional Japanese music by the acclaimed koto and shamisen player Yoko Reikano Kimura, offered with an exclusive taste of beautiful Japanese seasonal wagashi (sweets) prepared by mochi Rin NYC. This will be the fourth and final program in a seasonal series of music concerts called Four Seasons in New York — Gems of Japanese Music. After many centuries, the brilliance of traditional Japanese music is still being passed on to the present day. This concert series features each season’s representative traditional works along with the colorful and delicate Japanese style confectionaries expressed through ingredients. Elderflower, rose, edamame and sansho (Japanese pepper) are abundant in summer; chrysanthemum, apples, grapes, chestnuts and hazelnuts in autumn; followed by yuzu and kumquats in winter; while spring traditionally begins with sakura (cherry blossoms), broccoli rabe, strawberries and raspberries. Even within one season, the taste and the form change gradually from hashiri (first harvest or catch of the season) through nagori (the final traces). As a frequent soloist and collaborator, Japanese born koto/shamisen performer and singer Yoko Reikano Kimura has performed in NYC, Chicago, Tokyo, Kyoto and many other cities, featuring a wide-ranging repertoire from classical Japanese music to improvisational pieces. Since Yoko moved to the US in 2010, her mission has been to promote Japanese music to American audiences. As part of the award-winning Duo Yumeno, she has just released the album Flowers, Birds, Wind, Moon: The Music of Marty Regan. mochi Rin creates bite-sized mochi desserts made by infusing New York’s locally sourced ingredients into Japan’s popular organic bean paste. Their new type of mochi mixes seasonal fruits and flowers from New York into Japanese traditional desserts such as daifuku and sakura-mochi. The ticket price includes wagashi. Seating is limited, so purchase your tickets in advance at CRS’s website, by phone 212-677-8621, or in person at CRS.